Don’t miss the first joint concert by the Swiss Armed Forces Central Band and “The President’s Own” U.S. Marine Band at Union Station. At the end of April, the Swiss and U.S. national anthems will reverberate in the Main Hall at Union Station. 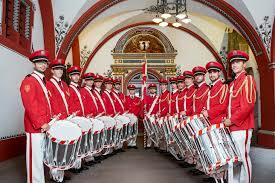 In addition, they will play the most famous Swiss march, the “General Guisan” March. The Swiss Armed Forces Central Band thrills the public all over the world. Among other events, they have participated in the Norsk Military Tattoo in Norway, the Basel Tattoo and the Hamina Tattoo in Finland. Colonel Jason Fettig and Major Aldo Werlen are responsible for the musical direction. The event is free and open to the public. No reservation required.